This is a very straight forward and easy-to-use professional grade barcode label design and printing software application that also contains many advanced features. It contains a built-in, embedded database for creating custom values in labels and also connects to comma delimited text files, CSV files, Microsoft Excel and Access. Barcode values can also be incremented or determined by VB script formulas. Static data can be easily appended to the beginning or ending of any variable data. 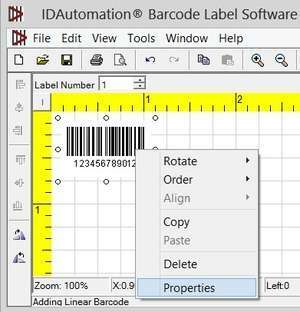 IDAutomation Barcode Label Software 10.5 is a shareware program and can be used as a demo to try the software until the free trial period has ended. A full version of the program is available after the trial period ends. For security reasons, you should also check out the IDAutomation Barcode Label Software download at LO4D.com which includes virus and malware tests. Additional screenshots of this application download may be available, too. IDAutomation Barcode Label Software has a presence on social networks.